Joseph Salvia, former St. Louis Globe Democrat reporter, who covered Bridgeton, Missouri in the late 1960s and early 1970s talks about being offered and rejecting a bribe by former Parks Commissioner of Bridgeton, Joseph Sparacio. Outtake from The First Secret City. Mike Petersen, former chief of Public Affairs for the U.S. Army Corps of Engineers St. Louis District speaks about progress on the clean up of Coldwater Creek in North St. Louis County, and a citizen at the Jan. 2015 meeting of the Formerly Utilized Sites Remedial Action Program asks why there are no warning signs posted near the creek. Almost a year later, no radiation signs have been posted along the creek, either at St. Cin park in Hazelwood, Missouri or at St. Ferdinand Park in Florrisant, Missouri. St. Cin Park was closed down after a protest in August but the signs simply say “Park closed” without the warning radiation symbol that would indicate why the park is closed. At St. Ferdinand Park there is orange netting surrounding the clean up area and no signs indicating why it is there or that people, especially children, should avoid the creek. Outside of the orange netting, which could be easily jumped over or pushed down, the creek is open and free for people to access. This failure and reluctance to inform the public about the very real risks in these public spaces goes to the heart of the reason people still don’t know about St. Louis’ role in the Atomic Age. The U.S. Army Corps of Engineers is doing the right thing by cleaning up the waste. But when there are no signs posted or the parks remain open during the clean-up, it suggests that the silence and denial surrounding St. Louis’ secretive radioactive history continues. A person walking through that park may not understand the significance of flimsy orange netting. So the question remains: Why aren’t there warning signs along the creek? “It just makes me sick,” say Kay Drey. 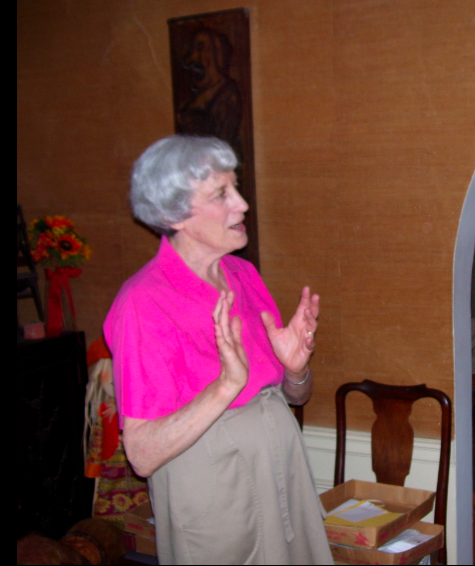 The 81-year-old dean of the St. Louis environmental movement is sitting at her dining room table, which is scattered with various paperwork, including two dogeared reports issued by the Nuclear Regulatory Agency in the 1980s. As the sun streams through a window of her University City home on this mild January morning, she bemoans the state of affairs related to the stalled clean up of the radioactively-contaminated West Lake Landfill in Bridgeton, a nearby St. Louis County suburban municipality. The NRC reports to which she refers both candidly recommend the removal of the radioactively-contaminated materials from the landfill, which is located in the Missouri River flood plain upstream from water intakes for the city of St. Louis. The waste, a byproduct of decades of uranium processing carried out by Mallinckrodt Chemical Works on behalf of the government’s nuclear weapons program, was illegally dumped at West Lake 40 years ago. Drey has been fighting various regulatory agencies to get it removed for almost as long. On this day, Drey’s voice is failing. It can’t compete with Moxie, the family’s small dog, who yaps at a visitor’s feet. After the canine commotion subsides and breakfast dishes are cleared, Drey explains what is bothering her. “They’re not talking about digging it up,” she says. Removing the radioactively-contaminated materials from the St. Louis area to a federally-licensed nuclear waste depository in the sparsely-populated West has long been her goal. In 2008, Drey and the Missouri Coalition for the Environment challenged the EPA’s record of decision on West Lake, which would have mandated a relatively cheap fix — capping the landfill with dirt and leaving the nuclear materials in place. Republic Services, the liable landfill owner, favors this remedy, which would allow the contamination to continue migrating into the ground water. The final decision is still up in the air along with noxious landfill fumes that have been the bane of nearby residents for the last four years. Since 2010, public outrage over the issue has grown due to an underground fire at the adjacent Bridgeton landfill, which is part of the same EPA Superfund site. The Missouri Department of Natural Resources is overseeing efforts to contain the fire, which is moving in the direction of the radioactive waste. To bolster DNR’s authority, the Missouri Attorney General’s office has filed suit against Republic for various infractions. Splitting responsibility for dealing with the problem between the state and federal agencies has led to further bureaucratic snafus. One of the impasses involves a state-mandated barrier wall to stop the fire from advancing. Drey and other activists advocate turning the clean up over to the U.S. Army Corps of Engineers, the agency that has remediated other St. Louis radioactive sites under the Formerly Utilized Site Remedial Action Program (FUSRAP), which targets sites contaminated with nuclear weapons waste from World War II. Gaining congressional approval for such a change has not happened, however, despite efforts by the activists to spur the St. Louis congressional delegation to sponsor the requisite federal legislation. Meanwhile, Republic, the responsible party, keeps pushing the original capping proposal. The company’s public relations efforts have included backing a rural-based front group, the Coalition to Keep Us Safe which is against shipping radioactive material through the state. The Coalition to Keep Us Safe, via their twitter feed, routinely uses the words “capping” and “encapsulation” to mean the same thing. The terms are used interchangeably by the group, but “encapsulation” is not part of the 2008 Record of Decision issued by the EPA. The confusion of terms is not clear to a casual observer or to many members of the Coalition as seen in the tweets they post. As the debate wears on, Drey sees support for removal of the waste waning. But she’s standing her ground. There is no compromise on this subject when viewed from her eyes. Those who consider capping as an option are abandoning the goal. In her opinion, it is indefensible to leave deadly radioactive waste to drain inevitably into the Missouri and Mississippi Rivers forever. Drey also sees how language is being used to obfuscate the issue. Supporters of capping the landfill often use the word “encapsulation” to describe the plan to leave the waste in the floodplain, leaking into the aquifer. “Does a capsule have just a top?” she asks. When C.D. Stelzer called the Department of Energy’s FUSRAP office back in 1997, a secretary for a private company answered the phone, two corporate managers acted as mouthpieces for the government, and the DOE official in charge had gone elk hunting. IT’s shift change on Friday afternoon at the Boeing plant north of Lambert Field and workers are fleeing in droves, streaming bumper-to-bumper down McDonnell Boulevard, oblivious to the narrow, 21.7-acre piece of real estate next to the thoroughfare. Until recently, this barren stretch of earth offered little to see besides an abundance of weeds surrounded by a rusty cyclone fence topped with barbed wire. In late September, however, the U.S. Department of Energy (DOE) began rearranging the landscape on the property. From the shoulder of the road, where it crosses Coldwater Creek, a yellow bulldozer and backhoe can now be seen parked near a plywood wall extending across the top of the steep embankment leading down to the creek bed. It’s hard to tell, at a glance, that the work in progress here is part of an overall federal project estimated to cost nearly $800 million. Ordinary building materials — bales of straw, rocks and plastic sheeting — create a setting common to construction sites. But this is no ordinary erosion-control action. Soil at this location, known in regulatory circles as SLAPS (St. Louis airport site), harbors deadly byproducts of the nuclear-weapons industry, which developed during World War II and mushroomed in the Cold War. From 1946 until the mid-1960s, the U.S. Army — and, later, the Atomic Energy Commission (AEC) — dumped hundreds of thousands of cubic yards of radioactive waste, residue from uranium processing at the Mallinckrodt Chemical Works in St. Louis. As a consequence, the acreage, which is now owned by the St. Louis Airport Authority, has been contaminated with increased levels of uranium-238, radium-226 and thorium-230, according to the DOE. This is no new discovery, of course. Official foot-dragging has been going on for decades. More than 20 years ago the DOE discovered that contaminants had migrated into ditches next to McDonnell Boulevard, where they have settled only inches from the surface. There are still no signs to warn passersby or curious onlookers of this danger. Failure to inform the public and act in a timely manner has been the hallmark of this case. At the same time, public-health officials have consistently downplayed or ignored the potential health consequences of radiation exposure. After allowing the waste to spread for more than 50 years, the federal government is now belatedly rushing to deal with the problem in a fashion comparable to its past negligence. In the process, rules have been sidestepped and decisions made without a full understanding of their implications. The powers-that-be first attempted to keep the problem a secret, after World War II, for “national-security reasons.” By the late 1970s, however, the festering pollution had become a heated public issue. The waste itself has proven even more difficult to contain than the controversy over it. COLDWATER CREEK, which is next to the site, flows through a large section of North St. Louis County and has acted as a convenient vehicle to transport the toxic materials. So far, radioactive contaminants are known to have hitched a ride downstream more than seven miles, according to the DOE. And the migration is continuing. Tests conducted in late 1994 show stormwater runoff at the location still exceeding acceptable radiation levels set by the agency. Drinking-water intakes for the city of St. Louis are located several miles downstream from the site, on the Mississippi River at Chain of Rocks. The radioactive migration by way of groundwater has also been confirmed but is less well understood. For years, the DOE claimed the waste presented no danger. But the scientific community, which has been moving much more slowly than the waste, has finally concluded that no safe level of radiation exposure exists. By the time this decision was made several years ago, it was also widely accepted that one direct effect of long-term exposure to low-level radiation is cancer. The $8.3 million cleanup along Coldwater Creek is the first stage of the long-anticipated project. The initial phase involves removing at least 6,000 cubic yards of the contaminated soil to a licensed repository for low-level radioactive waste, located in Utah. The amount is only a small fraction of the contaminated materials that may ultimately be excavated and shipped from the site. The approximate completion date: 2004. But the entire project now stands in bureaucratic limbo. Less than a month after the DOE started working at the airport site, Congress transferred authority for the cleanup to the U.S. Army Corps of Engineers. The change came about as a part of the latest Energy and Water Appropriations Bill, signed into law by the president in October. Under the legislation, the corps will be handed the remainder of the $5 million already allocated to the DOE for this fiscal year to shore up the small section of Coldwater Creek. The money is in addition to the $140 million appropriation for 1998 that continues funding a nationwide cleanup of low-level radioactive-waste sites. The act also stipulates that the corps must conduct a three-month assessment of the Formerly Utilized Sites Remediation Action Program (FUSRAP), the federal aegis under which the airport site falls. For the time being, the cleanup of Coldwater Creek is expected to continue uninterrupted, according to David Leake, project manager for the corps. “Congress has made it fairly clear that they do not want the transfer to result in any delay,” says Leake. This pragmatic strategy, however, locks the corps into adopting some of the DOE’s prior policies and practices, many of which have fallen into question in the past. Even though the airport site is on the U.S. Environmental Protection Agency’s (EPA) National Priorities List (NPL), the DOE, through a regulatory loophole, was allowed to proceed with the Coldwater Creek excavation without formulating any long-range cleanup plan for the entire site. Furthermore, the DOE’s interim plan admits the area now being dug up may have to undergo remediation again sometime in the future. In other words, the current work is at best a stopgap measure. The project may also leave some radioactive contaminants behind because the excavation doesn’t go deep enough. In addition, the DOE started working on the site before a hydrogeological study, which it commissioned, had been completed. A previous hydrogeological study, published last year, cautioned that the groundwater system underneath the site was not clearly understood. The panel of experts concurred that implementation of any excavation work would necessitate further site characterization. that water rolls downhill. By beginning the cleanup at the low end of the site, the DOE hoped to create a buffer that would stop or at least slow the migration of the radioactive pollutants into the creek. But by starting at this point, the department admittedly risks re-contaminating the area it has chosen to clean up. Sheet erosion from rainfall will continue to allow contaminants to move toward the creek. Groundwater will head in the same general direction. Indeed, the subterranean currents may circumvent the DOE’s efforts altogether because, according to the experts, the hydrogeological structure beneath the site pushes groundwater both north and west under McDonnell Boulevard. “I’m delighted that they are beginning to clean up the airport site,” says Kay Drey, an environmental activist from University City. “But they’re not doing it safely.” Drey, who fought for the cleanup for years, resigned from the project’s oversight committee on Sept. 18 (see accompanying story). In her resignation letter to St. Louis County Executive George “Buzz” Westfall, she expressed disapproval of the DOE’s interim plan, citing what she considers to be inadequate precautions. Before her resignation, she had submitted a detailed eight-page critique of the DOE’s plan. To date, she has received no answers to her questions. FROM THE MCDONNELL Boulevard bridge, the turbid waters of Coldwater Creek are visible, flowing past chunks of concrete debris and swirling around a white plastic lawn chair marooned midstream. It is a typical suburban scene, a once-pristine waterway relegated to carrying sewage. Coldwater Creek carries other pollutants, too: Jet fuel from nearby Lambert Field has found its way into the watershed, as have salt, oil and automotive antifreeze, according to a DOE assessment. Another pollutant in the surface water is trichloroethylene, a known carcinogen. No one is certain of the long-term effects of such mixed waste on the environment or human health. It is also unknown how the chemical stew affects the migration of radioactive contaminants in surface and groundwater. In essence, the airport site is a very large experiment with few scientific controls attached. On the basis of data provided to it by cleanup-site contractors, last year’s hydrogeological panel decided contamination levels at the site would not pose an imminent risk for the next 100 years, an arbitrary figure imposed by the DOE’s guidelines. Yet some radioactive isotopes already discovered in ground and surface water at the site will last for hundreds of thousands of years. Although it downplayed the risks over the next century, the panel nevertheless concluded it would be inappropriate to use the site for long-term storage and repeatedly stated that many questions about the hydrology of the area remain a mystery. Tom Aley, a hydrologist who sat on the panel that studied the St. Louis airport site, is sure of one thing: The waste should have never been dumped here in the first place. Similar to Hanford, the waste here is situated on top of an aquifer. “It is a very poor site for disposal of that type,” says Aley, who owns Ozark Underground Laboratory Inc. Aley lists population density, groundwater contamination and the proximity of the site to Coldwater Creek as reasons not to store radioactive waste at the airport site. Although the DOE acknowledges contamination at the site extends at least 18 feet deep, its interim plan requires digging only “eight to 10 feet below the existing land surface,” according to a Federal Register notice published in September. The DOE also acknowledges that “soil contaminated with radionuclides is present below (the) water table.” If contaminated groundwater is encountered during the dig, the DOE’s interim plan calls for it to be pumped onto high ground, which means it will re-enter the aquifer or run back downhill, toward the creek. To battle this inevitable gravitational pull, the DOE has built a berm to separate the excavation work from the rest of the site. The interim action also calls for a channel to be constructed to reroute stormwater away from the roadside ditch that drains into the creek. In 1985, the DOE constructed a gabion wall — rocks secured by a wire basket — to hold the bank from sliding into the creek. It is a porous structure that by design allows water to percolate through. Whereas the effectiveness of these measures is subject to debate, there is no argument that radioactive sediments can still move downward into the aquifer and flow northwest under McDonnell Boulevard, thereby entering the creek unimpeded. Three thousand people live within a one-mile radius of the airport site, according to DOE estimates. From the airport, Coldwater Creek flows northeast for 15 miles, touching the communities of Berkeley, Hazelwood, Florissant and Black Jack before discharging into the Missouri River. The city of St. Louis drinking-water intakes at Chain of Rocks, which supply water to hundreds of thousands of people, are five miles downstream from where the Missouri joins the Mississippi. By any standard it is a densely populated watershed. DOE guidelines for thorium and radium concentrations mandate they not exceed 5 picocuries per gram averaged over the first 15 centimeters of soil and 15 picocuries per gram in subsequent soil layers of the same thickness. Analysis conducted for DOE in 1985 indicates that soil next to Coldwater Creek is contaminated with as much as 14,000 picocuries of thorium-230 per gram. The naturally occurring background level for the same radioactive isotope amounts to 0.2 picocuries per gram. The corresponding guideline for acceptable DOE levels of uranium-238, which is also found at the airport site, is 50 picocuries per gram. In 1981, DOE initiated a two-year groundwater-monitoring program at the site and discovered uranium-238 at concentrations up to 2,230 picocuries per gram. Other evidence shows radioactive waste is spread across the site at levels thousands of times greater than considered acceptable. A curie is the amount of radiation emitted from one gram of radium, equal to 37 billion decays per second. A picocurie equals a trillionth of a curie. Curies are used to measure the amount of material present; they don’t indicate the amount of radiation given off or its biological hazards. Such DOE standards ignore potential health consequences, according to a 1991 congressional study. “The present regulatory-driven approach … places far more emphasis on characterizing the contamination than on investigating health impacts and may prove ill-suited to identifying public health concerns, evaluating contamination scenarios according to their potential for adverse health effects, or establishing health-based clean-up priorities,” the Office of Technology Assessment report states. JOHN W. GOFMAN, a professor emeritus of medical physics at the University of California at Berkeley, has long contended that there is no safe level of radiation exposure. “I concluded it’s impossible for such a level to exist given the evidence on how radiation works,” says Gofman. The term “low-level radiation” is a political term used by the nuclear industry to lull the public into accepting exposure risks, he says. Similar phrases also downplay the consequences. “The terms `tolerance level,’ `allowable level,’ `permissible dose’ — those are all phenomenal words that are supposed to tell Joe Six-Pack, `Nothing to worry about — there ain’t no harm.’ That’s why these terms came into existence,” he asserts. The 79-year-old Gofman is in a unique position to advise on such matters because he is a physician and holds a doctorate in nuclear physical chemistry. His research at Berkeley during World War II attracted the attention of J. Robert Oppenheimer, lead scientist in the Manhattan Project. After working on the atomic bomb at Oppenheimer’s request, Gofman completed his medical studies. But in 1969, Gofman fell from grace with the atomic establishment when he challenged the “acceptable” levels of radiation exposure then allowed. THIS IS NOT THE FIRST TIME Drey has opposed a DOE project. In 1993, she battled the department’s plans to clean up radioactive waste at nearby Weldon Spring in St. Charles County (“Rushing Water,” RFT,Jan. 6, 1993). Her vigilance then temporarily delayed that project, after she exposed the fact that the DOE was going ahead before receiving critical EPA test results. Stephen H. McCracken, who headed the Weldon Spring cleanup, took over as St. Louis airport-site manager for the DOE earlier this year. Although the circumstances and nature of the radioactive waste may be different at the airport site, McCracken’s job switch hasn’t seemed to have affected his ability to circumvent government guidelines. If anything, the DOE official’s evasive end-runs appear to have improved over time. Pryor, of the Coalition for the Environment, recalls that the decision was railroaded past the citizens oversight committee on which he sits. “We had hardly seen this darn thing,” says Pryor of the recommendation to proceed with work along the creek. “When we asked McCracken in September, he admitted it was just a guess,” says Pryor, referring to the point at which the DOE decided to begin excavating. The measure squeaked past the committee on a 4-3 vote. “We thought it was silly to go forward without the geological study,” says Pryor. Four days later, on Sept. 22, work began at the St. Louis airport site. Every conceivable government agency — local, state and federal — was left out of the loop. Even the DOE official who has oversight into such matters said he was unaware the emergency clause had been invoked. “I suppose you’d have to ask Steve McCracken about that,” drawled James L. Elmore, a National Environmental Policy Act (NEPA) compliance officer for the DOE in Oak Ridge, Tenn. “I don’t have anything to do with that. You’d really have to ask him exactly what his total thought process was.” Despite his ignorance, Elmore’s name appears on the bottom line of the Sept. 18 Federal Register notice. The RFT could not initially reach McCracken to explore his “thought process,” because, according to the secretary at the DOE site office, he was elk hunting in Colorado. After returning from his expedition, the DOE manager still did not return repeated calls placed to his office for a week. In his Sept. 18 waiver memo, however, McCracken wrote he had expedited the cleanup out of concern that autumn rainfall would make excavating near the creek more difficult. Come hell or high water, McCracken is expected to continue working at the site, at least during the transition period. The airport site is on the Superfund’s NPL list, according to Dan Wall at the EPA regional headquarters in Kansas City. Because of its priority status, the agency is obliged to oversee the cleanup, he says. But it appears the contractors are more in control of the project than anybody else. Calls placed to the DOE’s site office in St. Louis are answered by the cheerful voice of Edna, a secretary who works for Bechtel National Inc., one of the DOE’s prime cleanup contractors. She takes messages for McCracken and his assistant. In this case, she took messages for nearly two weeks, and for nearly two weeks the calls went unreturned. Finally, representatives for the DOE’s two prime contractors called back. The change in management styles will affect all of FUSRAP, which originated in 1974 under the AEC, the predecessor of the DOE. AEC established FUSRAP to deal with radioactive waste produced as a byproduct of nuclear-weapons production. Of the 46 FUSRAP sites across the country, 25 have been cleaned up, according to the DOE. Four remaining radioactive hotbeds are in the St. Louis area, with the airport site the largest. In St. Louis and elsewhere, the DOE has relied on the expertise of Bechtel and Science Applications International Corp. to carry out its mission. The oversight committee currently has 11 members — five from the city of St. Louis and six from St. Louis County. One seat remains vacant at this time. The board replaces an advisory task force that disbanded last year. AT ONE TIME, workers toiled night and day to dump the radioactive waste at the airport site. The open pile rose to 20 feet above ground level, according to one DOE document. Altogether the accumulated waste at the site and elsewhere nearby is estimated to have once ranged from 283,700 to 474,000 cubic yards, according to the DOE. In additional to open dumping, Mallinckrodt workers were required to hand-pack waste in 30- or 55-gallon drums. The drums were then stacked on top of each other at the airport site. The barrels then began to leak. In the process of storing the waste, haul routes and adjacent properties became contaminated. Then in 1966, the AEC sold most of the residues to Continental Mining and Milling Co, which promptly transported the waste to 9200 Latty Ave. in Hazelwood and then went bankrupt. The movement resulted in the contamination of more properties. Cotter Corp., a subsidiary of Commonwealth Edison, subsequently acquired the materials, with an eye toward reclaiming some of the minerals. The bulk of it ended up in Canon City, Colo., but not before one of Cotter’s subcontractors dumped thousands of tons of the waste in the West Lake landfill off Old St. Charles Rock Road in North St. Louis County. More than 50 years after it started, the uranium-processing operation conducted at Mallinckrodt in St. Louis has forced almost $800 million in reparations on U.S. taxpayers — the cost of cleaning up the radioactive vestiges of World War II and the arms race that followed. To the victors go the spoils. It is a small part of the environmental damage wrought by the federal government and the nuclear-weapons industry over the last half-century — damage estimated to cost $200 billion to correct. What can never be measured are the lives cut short because of radiation exposure. Men have been tried for war crimes that did far less. In the middle of an asphalt schoolyard more than a half a century ago, I stood alone, doffed my skull caps and flung them in the air. Both homemade yarmulkes were secular creations — byproducts of the nuclear age — the outer one fashioned from a white cotton sock, its inner lining sewn from nylon hosiery. To me, they were symbols of separateness at public elementary school that year. A year in which I had often been segregated from classmates. But now it was spring, a long-awaited reprieve had finally been granted. Health officials ruled my condition no longer posed a threat to other students. I could attend the coming school picnic with no chance of infecting others. On my way home that day, my 7-year-old bald head felt the wind and sun for the first time since the previous fall. I missed more than a month of the school year in 1957 and 1958. But the unpleasant memories would be tossed away, forgotten like my discarded skull caps in the schoolyard, and the parental reprimand I received for not disposing of them properly. My hair would grow back. A summer of bicycles and hoola-hoops awaited. My case of “tinea capitis” or ringworm of the scalp, as it is commonly called, sank into an abyss of statistical insignificance like an unknown factor within a lost equation. The fungi that had attacked my hair follicles were eliminated by what was then considered a normal medical procedure. But uncertainties that have since arisen from the X-ray treatment I received for this benign childhood disease will continue to shadow me for the rest of my life. A decade after my own treatment at St. Louis’ Children’s Hospital, a scientific study estimated that the scalps of irradiated ringworm patients had been exposed to as many as 800 rads of unfiltered X-rays, with lesser amounts being absorbed by the brain, cranial marrow, head, neck, parotid, pituitary and thyroid glands. My medical record shows I received five overlapping dosages of radiation, which each measured 353 roentgens. A roentgen calculates the air dosage, whereas a rad indicates the amount of absorbed ionizing radiation to the tissue. Other measurements have now supplanted these units, but according to one expert, administering multiple-doses of this degree was not uncommon. By contrast, a person who receives a diagnostic chest X-ray absorbs about .02 of one rad. Ringworm patients in my category have been used for comparative analyses along side Japanese atomic bomb survivors and Marshall Islanders who were exposed to atmospheric testing of nuclear weapons. Subsequent scientific papers have indicated that over time there have been significant increases in tumors as well as skin, thyroid and brain cancers among those who received the X-Ray treatment. One study has also correlated more psychiatric problems among irradiated ringworm patients. By 1959 — a little more than a year after I had contracted tinea capitis the accepted treatment for the disease had changed. An anti-fungal agent called “griseofulvin” became the standard remedy. X-ray therapy is no longer applied to those who have ringworm of the scalp. But before use of the method ended, an estimated 200,000 children worldwide underwent irradiation, with perhaps 10 percent of those cases originating in the United States. Ringworm of the scalp is but one of a number of different related fungi, which adds to the confusion over the disease. A Hungarian bacteriologist isolated the cause in 1843 and named it “Microsporon Audouini,” after a French scientist who specialized in the study of silkworms. This false association distracted scientists for sometime. The painful cure for the disease back then involved pulling a child’s hair out by its roots. Later in the 19th century, another French researcher, Raymond Sabouraud, recommended X-ray treatments as a more humane alternative. The radiation procedure that began to be used in 1910 took the name of two later researchers and was called the Adamson-Keinbock technique. It was widely used to treat post-World War II epidemics. After receiving my X-ray dose, a family doctor later diagnosed I had a thyroid condition. The physician, Eugene Hall, is now retired and has yet to be located. However, my hospital record includes a letter from my mother mentioning a rash that developed around the time of my X-ray treatment. A response from the hospital’s chief of clinics tersely dismissed her complaint that the rash still had not subsided seven months after the X ray treatment. According to a scientific report published just last year (1993), “the association between thyroid cancer and exposure to ionizing radiation was suggested as early as 1950.” Nevertheless, Children’s Hospital continued the use the Adamson-Keinbock technique for at least another eight years. There are those who sometimes jokingly refer to the EPA Superfund site in Bridgeton as the “Tony Soprano Landfill,” but it may be no laughing matter. 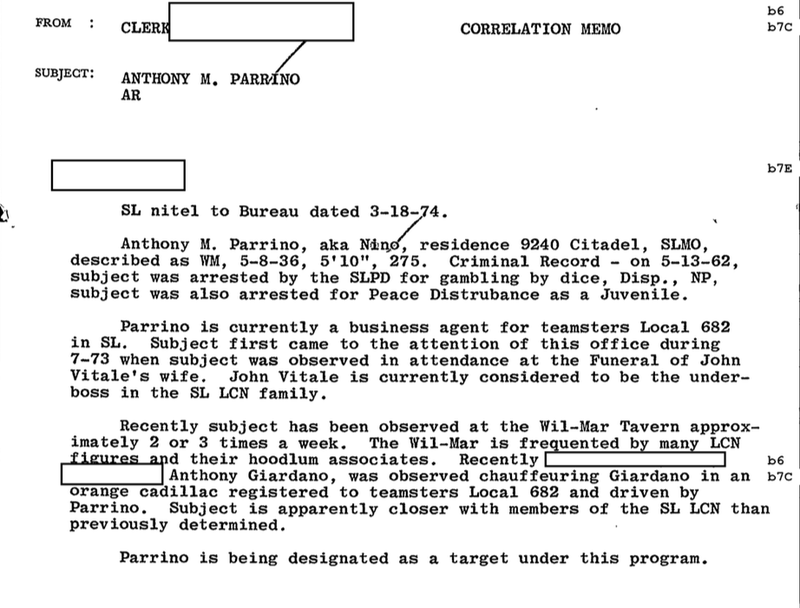 By his own admission, the late president of the West Lake Quarry Co., had dealings with reputed St. Louis underworld figure Anthony “Nino” Parrino for 20 years. Moreover, FBI records recently released under the Freedom of Information Act indicate Parrino fell under scrutiny of a federal labor-racketeering probe in part due to his ties to St. Louis Teamsters Local 682. Parrino became a federal law enforcement target in July 1973, according to the FBI records. He first appeared on the bureau’s radar ostensibly because he attended the funeral of the late John Vitale’s wife. Vitale was then second in command of the mafia here. Coincidentally, B&K Construction also began dumping radioactive waste at West Lake Landfill in July 1973. No evidence has been unearthed since then showing a direct connection between the two events. But that may be because the federal labor-racketeering probe here hit a wall. 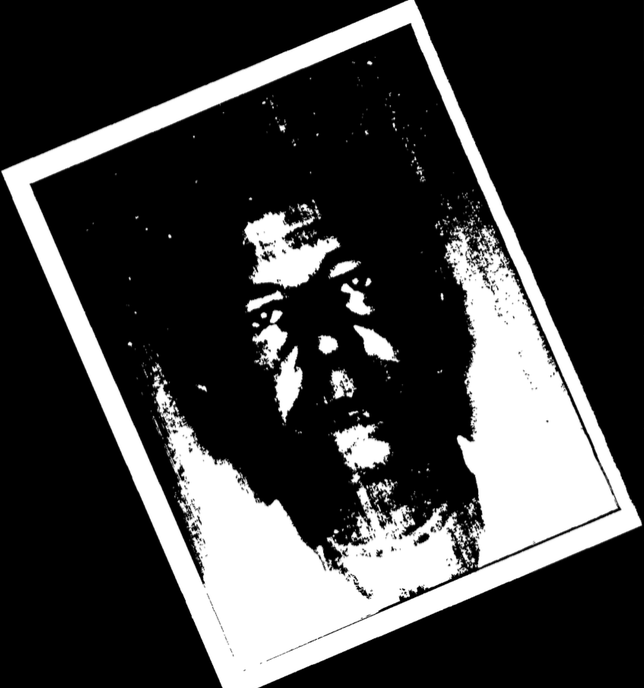 Any chance of connecting the dots ended in the late 1970s when political pressure from U.S. Rep. William Clay Sr. ultimately killed the federal Anti-Crime Task Force investigation in St. Louis. Parrino remained a 682 official until 1991. By then the Teamsters International Union had been placed under the custody of the U.S. Department of Justice due to alleged corruption inside the leadership of the union. Citing his ties to organized crime, the feds finally removed Parrino from his union post along with Local 682 boss Robert Sansone. St. Louis politicians and business leaders opposed the federal action and stood firmly behind the two. Among those publicly defending Parrino and Sansone was William J. McCullough, the retired president of West Lake Quarry and Materials Co. and West Lake Ready Mix Co. In a letter to the editor published in the St. Louis Post-Dispatch, McCullough lauded both labor officials’ professional ethics. McCullough’s letter indicates that Parrino was involved in representing union interests with the quarry owners from 1965 to 1985. It’s impossible to know what may have happened had the federal anti-crime task force not been shut down. The recent coverage of Bob Sansone, the president of Teamsters Local 682 and now vice presidential candidate of the international, prompts writing this letter. For a period of 20 years until 1985, I was a senior officer and finally president of the West Lake Quarry and Material Co. and the West Lake Ready Mix Co. Labor relations was a key part of my job. We worked with labor leaders from 12 different unions, and dealings with Sansone and Anthony Parrino were always done in a professional manner. Both Sansone or Parrino entered any grievance with an open mind and pursued it with diligence for their members. When the employee was right, both men worked for the maximum benefit for the employee; when the company was right, they pursued a course in the best interests of the employee, yet were fair to the company. Never were improper pressure or threats put forth by either person. Both were well versed in labor law. I do not know what Parrino’s alleged ties were or are to any other organization. I do know that I trusted him completely to deal fairly with us for the good of both the employees and the company. Washington University scientist Robert Criss characterizes the nature of the radioactive waste at West Lake Landfill. The First Secret City debuts Nov. 15 at noon at the Tivoli Theater as a part of the St. Louis International Film Festival.